Check out whats going on over on my Etsy! As promised, I posted four new hats for sale today! I hope you love them. I’m also taking custom orders and have already filled two orders that the clients have been positively thrilled with! Click images to go straight to the listings. Meer is inspired by the spirit of the sea and was created with intention to invoke the spirits of the west, of fluidity, memory and emotion. Silvan hearkens to the spirits of the wood and was created with intention to invoke the spirits of the north, of earth, stability, fertility and growth. I have set myself a deadline and I’ll be damned if I disappoint anyone! Elfin hoods will be up on Etsy before Valentines Day. If there are any particular color combos or themes you’d like to see, drop a comment here and I’ll try to take it into consideration when I go fabric shopping and patterning this week. Welcome back! It’s been a slow winter for the blog so far, but that’s because it’s been a busy winter out in the real world! I’ve been baking up a storm, making butter cookies, jam thumbprints and pumpkin pies as well as spending an ENTIRE day juicing freshly foraged green apples for a big batch of hard cider. I’ve also been rifling through thrift stores to start a collection of knit sweaters for my very own Dream Coat because Colin got a serger for Christmas! His family was incredibly generous and gave him a Baby Lock “Diana” which has been out in our living room since the 25th and we’ve had so much fun playing with it! 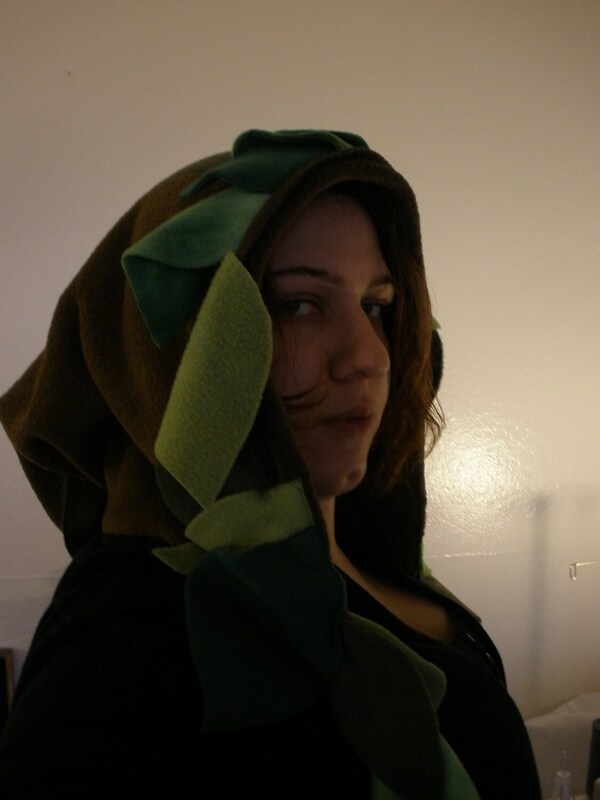 Since we had a bunch of leftover fleece sitting in the craft room, I decided I would come up with a cool hood pattern for it. 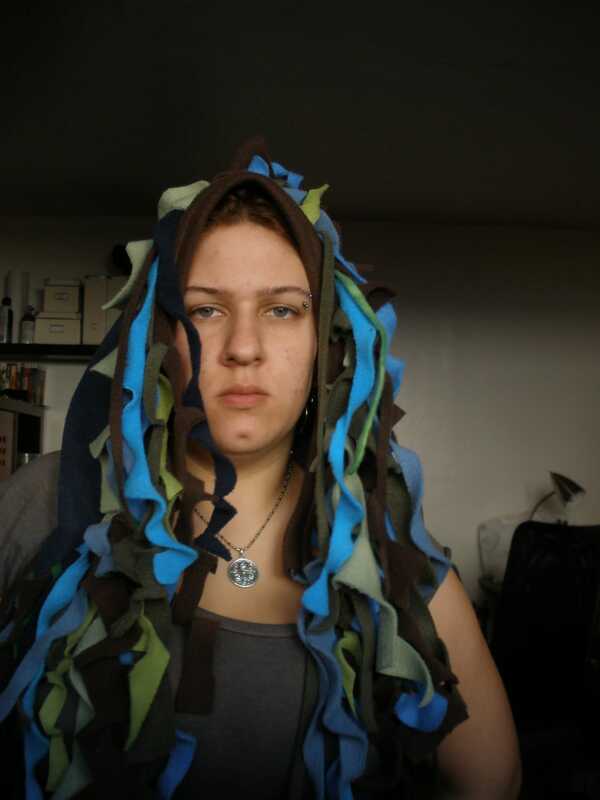 I sat and drafted for a while and eventually came up with a beautiful Elfin Hood. The top panel and scarf are pieces from fleece that had been sitting around at my mother’s for quite a while without any purpose while the dark brown side panels were cut from larger scraps left over from making cloaks earlier this year. Oh, and by the way, those leaves are pockets too! I was so excited about the project, that the next day, I went right ahead and sewed another! I didn’t have any more of the larger scraps, so I used smaller ones to create “flames” and even made a set of matching gauntlets. I’m so thrilled with the product and I thoroughly enjoyed sewing these hoods, so I am considering producing a few more for sale on etsy within the next couple months.